One of my favorite introductions to a novel. First, this is a story of a loosely connected group of Soviet spy apparats (networks) which operated in Nazi Germany, Nazi-occupied France, Belgium & Holland, & neutral Switzerland during the Second World War & which were collectively known as Die Rote Kapelle – The Red Orchestra. The Red Orchestra was not only one of the strangest spy apparats in the history of espionage, it was also one of the most effective, playing a vital part in the eventual destruction of the vile scourge of Nazism. 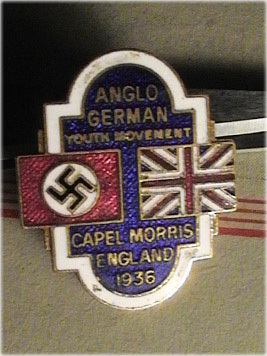 Its agents & informers included Russians, Polish Jews, Frenchmen, Belgians, Dutchmen, Hungarians, Swiss, Germans, & Englishmen. Although the Red Orchestra was a GRU (Glavno Razvedyvatelno Upravlenie, or Soviet Military Intelligence) apparat, its members included people from diverse political persuasions, ranging from committed Communists to right-wing conservatives, & from many different social classes, from aristocrats right across the spectrum to the proletariat. They included amongst their ranks professional GRU agents, businessmen, publishers, ordinary soldiers, a fortune teller & a group of high-ranking, strategically placed German officers who provided the Red agents with the day-to-day decisions & planning made by Hitler & the German High command relating to the course of the war on the Russian Front. This diverse collection of men & women, who in normal circumstances would have had very little in common, were united by a single common denominator – a hatred for Nazis. The German counter-intelligence agencies became aware of the existence of the Red Orchestra shortly after Hitler launched his invasion of the Soviet Union in June 1941, & thus began a hunt for the Red agents by the Abwehr (Military Intelligence) & the Gestapo (Secret State Police) which lasted for over two years. During this time, by dint of slow, painstaking detective work, lucky breaks, the application of ‘intensified interrogation’ (the euphemism for torture) & betrayal, the German sleuths slowly prised open the Red Orchestra. 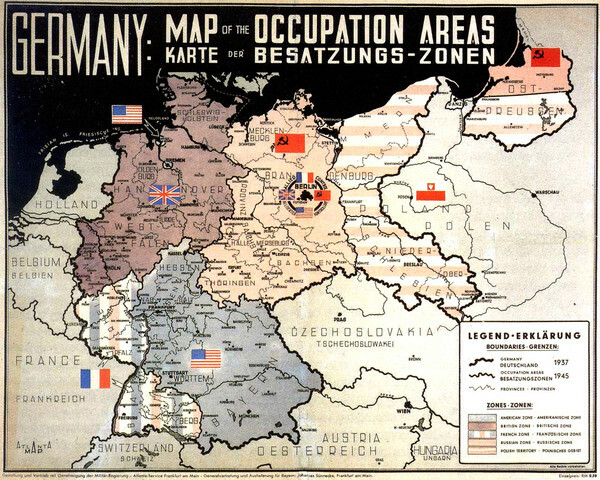 But by the time the investigation had been brought to a successful conclusion the German forces on the Eastern Front had been defeated, thanks in the main to the information sent to Moscow by the Red Orchestra. During the course of the next four nights the Kranz station intercepted further messages from the PTX pianist (as an enemy radio operator was termed in German counter-espionage parlance), & when the nature of these messages was reported to Lieutenant-Colonel Hans Kopp, commanding officer of the Funkabwehr (Signals Security), whose headquarters was situated on the Matthaikirchplatz in central Berlin, he ordered the radio monitoring stations in Germany & Nazi-occupied Europe to pay special attention to the PTX transmissions: “Essential discover PTX schedule. Night frequency 10,363 kilocycles. Day frequency unknown. Priority 1a’. As the PTX transmitter had burst into life only a few days after the invasion of the Soviet Union, Kipp was apprehensive that the recipient of the PTX messages might well be housed in Moscow & that the enciphered messages were the result of information gleaned by a Soviet spy ring at work somewhere in the Reich or the occupied territories. During the course of the next two months the monitoring stations intercepted some 250 messages taped out on the key of the PTX transmitter, but attempts to discover the location of the clandestine set by taking cross-bearings on the source of the signals produced inconclusive results: all that the radio experts could suggest was that PTX was operating from somewhere in an area covering southern Holland, Belgium, & north-eastern France. As it was essential to locate the city or town in which the pianist was holed up before a hunt by German counter-espionage agents could be mounted, such an imprecise report was as good as useless: they may as well have suggested the North Pole! In the meantime, however, a far more disturbing report landed on Kopp’s desk. Early in July the monitoring stations at kranz & Breslau, while searching the air waves for further PTX transmissions, intercepted messages from a second transmitter which was employing the same five-figure cipher as the PTX pianist. In addition, it was noted that the schedules & frequencies employed by this second pianist were closely related to the modus operandi of PTX, which strongly suggested that the two pianists belonged to the same espionage apparat. Moreover, attempts by the monitoring stations to pin-point the location of this second transmitter by cross-bearings had produced far more positive & alarming results: it was housed somewhere within a radius of less than five miles from the Funkabwehr headquarters in the very heart of Hitler’s capital! 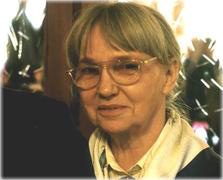 To make matters worse, the Funkabwehr codes & cipher evaluation analysts had come to the conclusion that the cipher employed by both pianists was of Russian origin, which presented Kopp with the unpalatable certainty that a Soviet spy ring was at work in Germany. 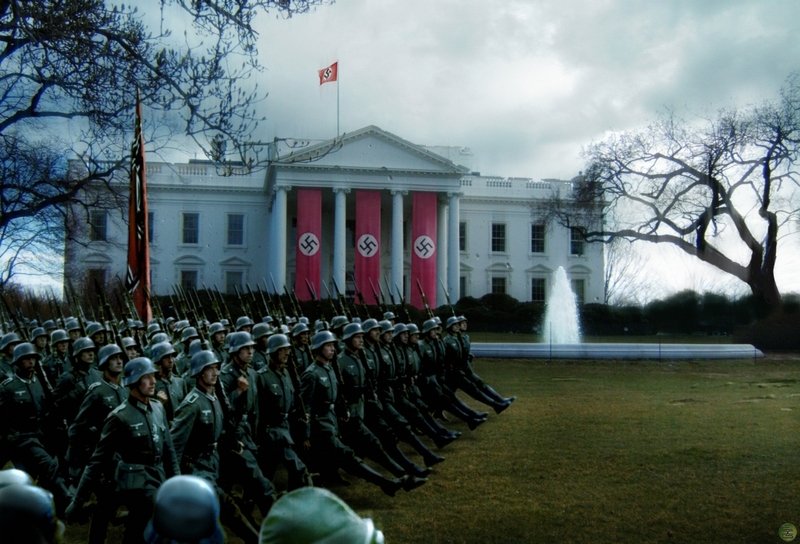 Kopp reacted to this discovery as though he had received a violent electric shock, for on the eve of invasion of Russia the counter-espionage agencies in the Reich has assured Hitler that Germany had been swept clean of Communists & Soviet underground agents. Indeed, the campaign to smash the German Communist Party – in its day, the most powerful in Europe – along with the Communist espionage & informer organizations of the Comintern (Communist International) had commenced immediately after the Nazis sized power in January 1933. 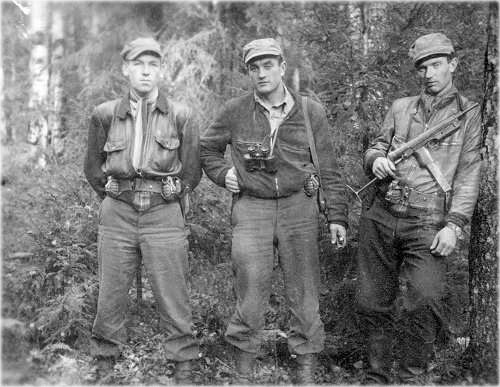 During the next eight years thousands of German Communists vanished behind the barbed wire of the concentration camps, while the Gestapo (Secret State Police), SD (SS Security Service) & Abwehr (Military Intelligence) methodically tracked down & liquidated the Comintern underground of saboteurs, informers & agents operating in the Nazi state. This violent campaign to rid Germany of ‘reds’ had obviously not been thorough enough, as evidenced by the sudden appearance of the Berlin pianist. 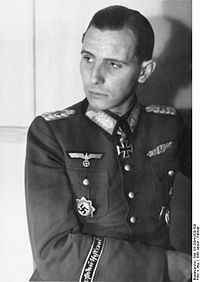 Goaded into action, Kopp dispatched three radio monitoring squads on to the streets of Berlin at the beginning of September to hunt down the enemy pianist, who had already relayed over 500 messages through the ether to Moscow. Theoretically, the location of a transmitter was a relatively easy matter. Three monitoring squads, each equipped with a direction-finder set (a receiver with a rotatable loop aerial) posted themselves at three different positions some miles from each other & each took a bearing on the clandestine transmitter when the pianist began tapping out his messages. The bearings were obtained by slowly turning the loop aerials until they reached a position where the enemy transmitter’s signal sounded loudest in the direction-finder receivers. The resulting data were then reported back to the squads’ commander, who drew the three reported lines of bearing across a street map commencing from the known positions of the three squads. The point at which the three lines intersected would then reveal the position of the transmitter on the street plan. That was the theory, but in practice the process of detection proved to be far more difficult. When Kopp’s monitoring squads began their hunt, disguised in post office mechanics’ uniforms & employing post office maintenance vans & canvas street shelters to hide their bulky direction-finder sets, they found their task beset with problems. Unlike the PTX pianist who transmitted practically every night, the Berlin pianist functioned capriciously, alternating bouts of feverish activity with spells of silence which sometimes lasted for days at a time. To compound this difficulty the monitoring squads also had to cope with the pianist’s campaign of subterfuge. To throw the hounds off the scent he constantly changed his call-sign & transmitted on a variety of wavelengths. For example, on one particular night he put out his call-sign on 43 meters, received his acknowledgement from Moscow on 39 meters & then switched to 49 meters to transmit his message. He also introduced an additional stratagem by putting out a fresh call-sign when he switched from 43 to 49 meters, to give the impression that another transmitter had joined in. To complicate matters still further, it soon became apparent from the bearings taken by three squads that the pianist was transmitting from three different places. Nevertheless, by October 21st, 1941 the detection squads had managed to narrow down the search to three approximate locations, each being less than two miles from Funkabwehr headquarters: one was near the Bayrische Platz to the south-west of Funkabwehr HQ, the second was to the eastward near the Moritzplatz & the third was due north in the area of Invalidenpark. By this stage Kopp was confident that a few more days of short-range direction finding would pin-point the actual tenement blocks used by the pianist, & a raid launched when he was actually tapping out his messages would bag the elusive quarry. During the night of October 22nd the three squads searched the air waves in vain for the tap of the pianist’s key. Frustratingly, it seemed, the pianist had lapsed into one of his periodic bouts of silence. Night after night the three squads continued to search the air waves without success until, more than a week later, it dawned on Kopp that the pianist, by some ocular means, had discovered or been warned that the hounds were closing in for the kill. Left with no alternative, Kopp withdrew his monitors & ordered the long-range stations to pay special attention to the Berlin area so that the Funkabwehr would be alerted should the wary pianist being transmitting again – if he ever did. In the meantime, Kopp had to admit defeat: the trail had gone cold. The book is mostly written in English suggesting it may have been intended to prepare future generations for rule in a Nazi government. It was published in 1942 – at the height of the German expansion across Europe. The work portrays Adolf Hitler as a “great peacemaker” & even suggested Britain had sought an alliance with Germany. The book is decorated with a picture of Stratford-upon-Avon & attempts to give an insight into British cultural icons, including Shakespeare. Entitled ‘Hirts Englandkundliches Lesebuch fur die Oberstufe an Oberschulen’ [‘English Textbook theory for Colleges & High Schools’], the text lavishes praise on Hitler. In a verdant Elviria urbanization the smell of jasmine & honeysuckle hang heavy in the air & an anonymous two-bedroom bungalow sits below a towering cork oak tree. A visitor could be forgiven for assuming that Las Cumbres was just another unremarkable costa suburb, but here, until the late 1990s, one of Hitler’s most loyal Nazi generals was able to live out a long & comfortable life. 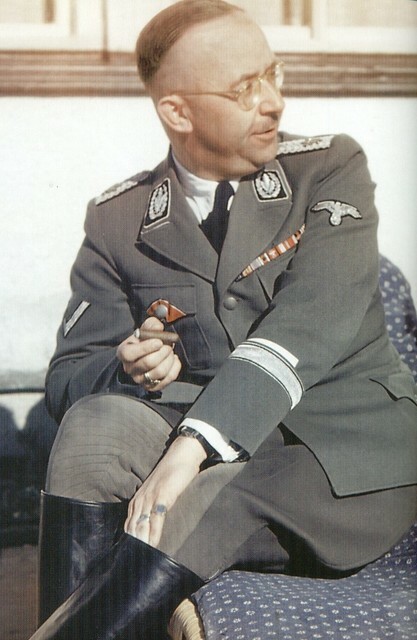 Major general Otto Remer – who played a key role in quashing a major assassination plot against the Führer in 1940 – was able to spend his final years in the modest 220,000-euro house surrounded by Nazi memorabilia & his ‘glorious’ memories. Refusing to repent right up to his death in August 1997, he regularly received correspondence & visits from fellow Nazis around Spain, as well as his monthly subscription to the surprisingly legal fascist organ Halt. 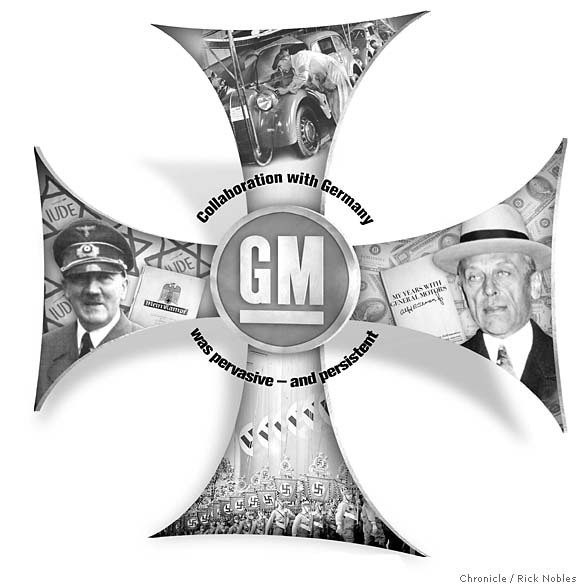 Just the day before, May 1, 1934, under a brilliant, cloudless sky, Mooney, president of the General Motors Overseas Corporation, climbed into his automobile & drove toward Tempelhof Field at the outskirts of Berlin to attend yet another hypnotic Nazi extravaganza. This one was the annual “May Day” festival. Tempelhof Field was a sprawling, oblong-shaped airfield. But for May Day, the immense site was converted into parade grounds. Security was more than tense, it was paranoid. All cars entering the area were meticulously inspected for anti-Hitler pamphlets or other contraband. But not Mooney’s. The Fuhrer’s office had sent over a special windshield tag that granted the General Motors’ chief carte blanche to any area of Tempelhof. Mooney would be Hitler’s special guest. 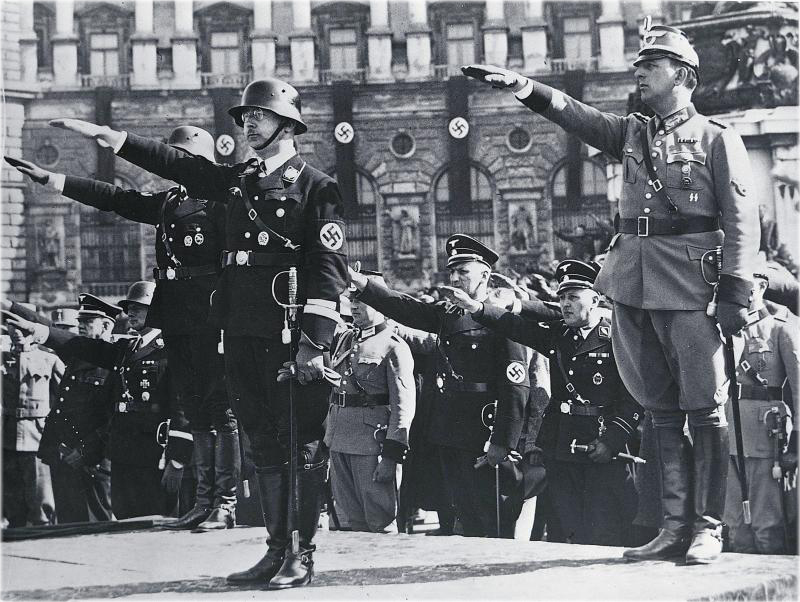 Between 1933 & 1945, Hitler’s Nazi regime conquered most of Europe & North Africa. It unleashed a war that took over 50 million lives. It forced tens of millions of people into slavery. & it carried out the biggest mass murder campaign of the 20th century. 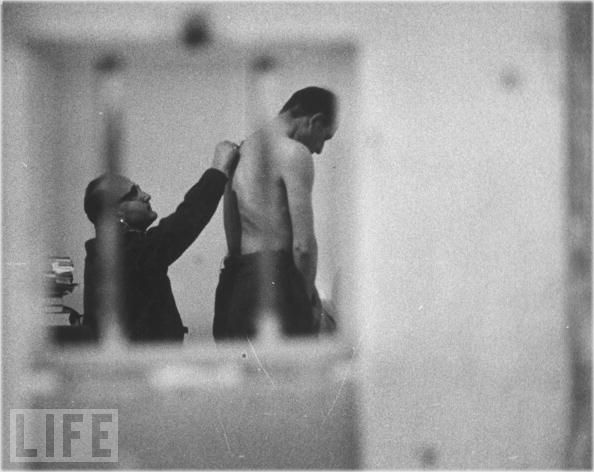 Six million Jewish people, half a million Romani’s, & millions of Slavic people were poisoned in gas chambers, shot, deliberately starved or tortured to death in fiendish scientific experiments. Hundreds of thousands of disabled people, gays, communists, socialists & other anti-Nazis–many of them German–were also murdered by Hitler. These crimes were carried out in the name of Nordic racial purity.